It's time for the New Product Launch! All the Stamps, Die-namics, and Stencils can be found HERE. Please remember to visit each of the MFT Designers' May New Product Launch posts on the MFT Blog and leave a comment by the end of the day on Thursday, May 7 for your chance to WIN one of two, $100 Gift Vouchers. Ready? Set. Comment! I have two fun cards to share with you today. The first one features a few of Lisa Johnson's new stamps and Die-namics. I stamped the Horizontal Stitched Strips with some of the smaller sentiments from the For the Boys stamp set. The ties were stamped in Sour Apple, Lavender Fields, and After Midnight Premium Dye Ink. They were then die-cut with the Terrific Ties Die-namics. The three ties were placed on a Cross-Stitch Rectangle. I seriously love these Cross-Stitch dies! On the inside of the card, I stamped another sentiment from the For the Boys stamp set. 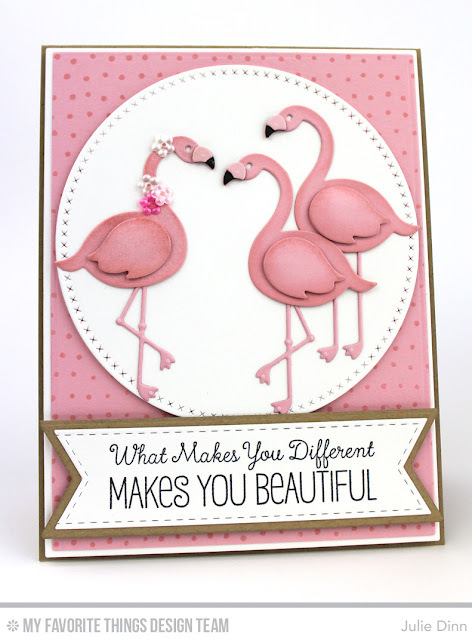 My second card features the fabulous new Flamingos Die-namics, Tickled Pink stamp set, Cross-Stitch Circle STAX Die-namics and the Myriad Dot Background. That's a whole lot of yummy goodness! 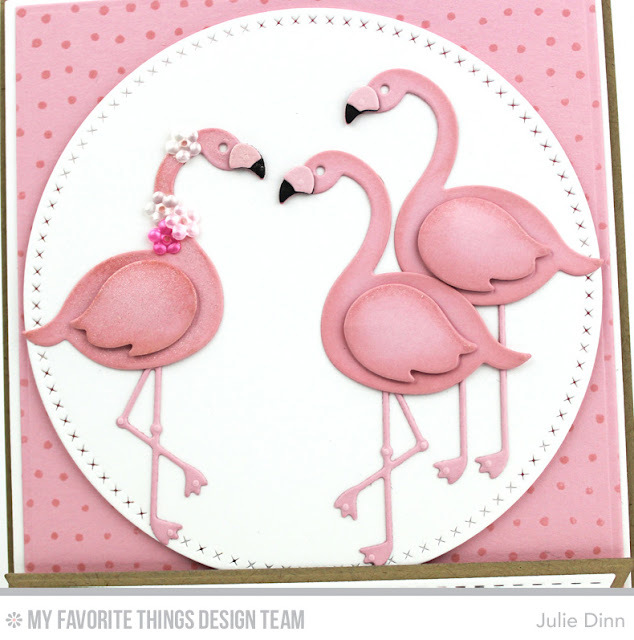 The fabulous flamingos were die-cut in Tickled Pink card stock. I applied adhesive to the back of the card stock before I cut the legs, this is so much easier than struggling to get adhesive on those skinny bits of card stock. The flamingo on the left was coated with a little shimmer from the Wink of Stella pen. Her fabulous flowers are from the Spring Flower Sequin Mix. I kept the inside of the card very simple. I stamped a sentiment from the Tickled Pink stamp set on a Cross-Stitiched Circle Die-namics. 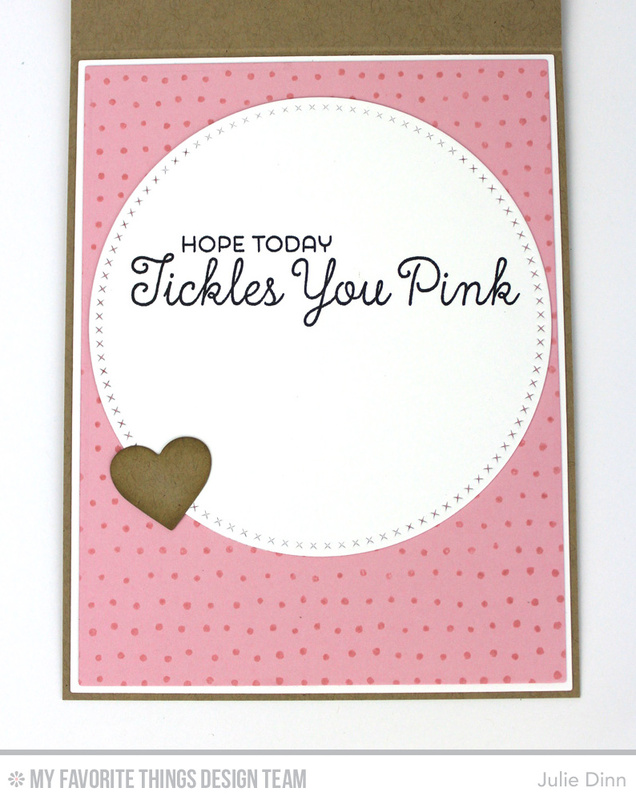 The background was stamped with the Myriad Dot Background and Tickled Pink Premium Dye Ink. Both of your cards are so vibrant, CAS and attractive - I just love them, esp the flowers on the flamingo! Love the ties, but I adore the flamingos! I really like the colors on the tie card, and the flamingos are just so cute! I love these. Those flamingos are adorable! Love love love these cards! So many possibilities with all of these sets.. I am so impressed with all the cards, and the mixing and matching of everything.. Thank you for sharing. Those flamingos are so amazing. Love them and the entire card. Need flamingo stamps for the dies!!! 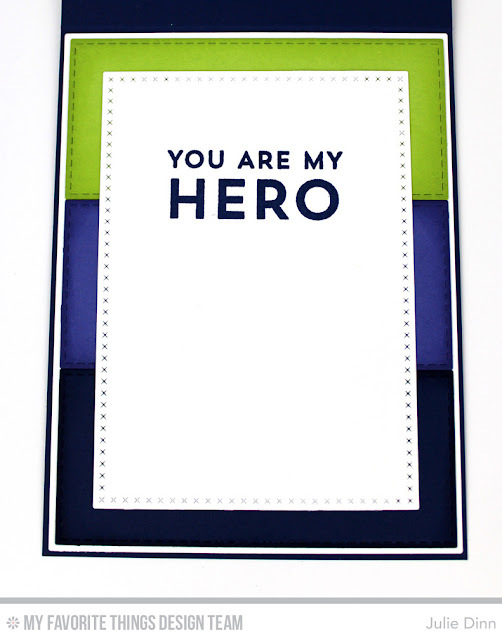 Love your use of colour blocking on the first card. It's a great idea to also use a different sentiment for the background of each colour. Very good! Both cards are just fabulous! Love the polka dot ties and the flamingos are growing on me with each card I see!! So cute...I especially like your addition to the flamingoes! Another great release from MFT! Fantastic card. I love the colour combination on your for the boys card. Those flamingos are such fun and I love the tickled pink sentiments. Great cards, I love the flamingos and the sentiments are so good. Both cards are great but I'm completely smitten with the second card! Love that flashy flamingo! Clever idea to add adhesive before die cutting the legs. Fun cards! The sentiment for the flamingos is great! Very nice cards Julie. Good work. Great cards, I love the flamingos. Such fabulous creations here!! I adore the ties with the masculine design and colors!! The flamingos are just so much fun! :) TFS! These are just awesome. Your tie card is adorable and your flamingos are beautiful. I like your color choice for the ties. Very pleasing to my eyes. And the flower on the flamingo adds the perfect touch. Love the colors and those flamingos.......makes me smile! sweet cards, love the crispness of the first card. I'm in love with all the cross stitch dienamics AND your flamingo card. The fancy flamingo with flowers is so cute! Great masculine card, love it! And the flamingos, oh so cute! Great cards! Love the flamingos. Yep yep yep, that first card was pinned for sure!!! The flamingos are such a hoot! I love these cards!! Thanks for sharing! Those polka dotted ties are just too fun! And those flamingoes? Oh, my goodness, are they cute! Both your cards are awesome. Totally different and totally awesome. The Flamingoes are just perfect and I love this pink and Kraft colour scheme. Such great cards. 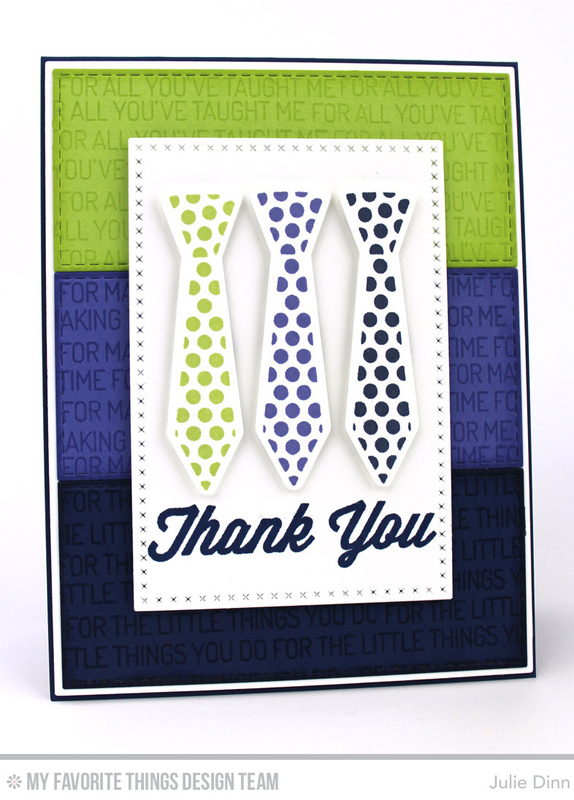 I love how you created the background on the tie card using sentiments from the stamp set. Love the embellishments on the flamingo card. It's all in the details! Beautiful cards! I love your color combos and card designs. Love both of these! Those 2 flamingos seem so jealous of the other, hehe! Your flamingos certainly did "tickle me pink". Who knew flamingos liked to dress up? These are all super!! I cannot get over these flamingos!! both cards are so beautiful! I love those flamingos! Stunning cards, both of them!! But oh my gosh, those flowers on the flamingo, fabulous!! Nice cards! I love the two cards! I love the tone on tone background with the stamping, it's unique! I love the flamingos too! The flamingo dies are really great!! Great cards! Love those flamingos. Thanks for the chance to win. 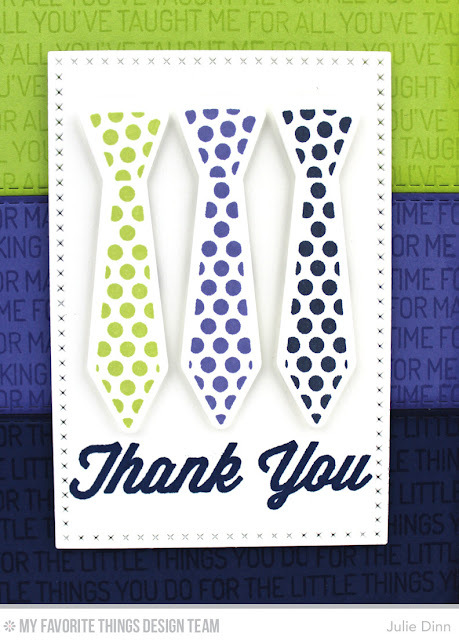 I love the colorful tie card. And those little flowers on the flamingo are so cute. That is a great set also. I like the colors on the tie card and the flamingos are beautiful! You've got everyone covered with these two cards! I really like what you did with your background for the first card, that was awesome. Those flamingos make me giggle, I love that you put some bling one of them. Julie both the ties and t he flamingos are fabulous! Cute idea to use the gems to make one flamingo different to match the sentiment. Great dad card and love the little flowers on the flamingo. Both fantastic cards!! I just can't get over those flamingos...they are so cute!! Wonderful cards! I really love those flamingos! These are both great cards! Those flamingos are so cute, and I really like the background you created on the tie card. card and that yummy lime color. Thanks for sharing such cute cards! Love your fancy flamingo wearing her sequin flowers - too cute! Thanks for the tip about the legs. The hero card rocks too, love the colors! Both the cards are beautiful but I really love the ties! I am loving those Flamingos...they are giving me such inspiration. Love the Tie card for that favorite male too. Fantastic job showcasing the new products. Both of these cards are beautiful! One feminine and one masculine! Love it! Wow I loVe them both. Thanks for sharing. Great polka dots on both of your creations, Julie!! Love the layers of color on the background and then matching the ties. Doing the same inside the card was great. The lady flamingo is darling - cute idea with the flowers. thanks for sharing some wonderful cards. What great cards! Really like the colorful ties and the blocks o color background. The sentiment and cute sequins on the flamingo are so precious. Thanks. Love the ties, Would make for a great fathers day card!